Johannesburg Medium B Prison has recently seen a violent outbreak of attacks between inmates affiliated to a gang and members of the Fear Free Life group that resulted in a three-week prison lockdown where inmates were confined to their cells for 23 hours a day. Lester Coutts, the senior ranking member of the 26s gang, who had a cell in A-Section, contacted the Wits Justice Project (WJP) – which investigates and exposes miscarriages of justice in the criminal justice system – with allegations of ongoing intimidation, harassment and assault by Fear Free Life members following an incident which left at least three gang members injured. The Wits project is in possession of photographic evidence of the injuries. Other 26s and 28s gang members also came forward to relate their experiences with Fear Free Life, a group that was founded in 2005 by ex-inmate and former general of the 26s gangs Collin Khumalo, under the guidance of senior prison officials. The department then recognised and accredited the group in 2011. 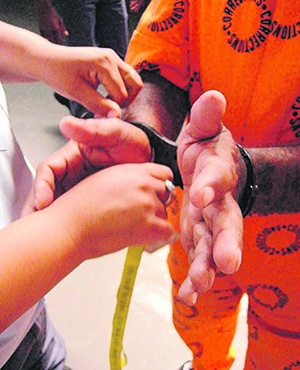 Its mission is to combat gangsterism and drugs, primarily within correctional centres. The organisation is active in most prisons around South Africa and also functions outside correctional centres. The numbers gangs are prison gangs consisting of three different groups – 26s, 27s and 28s – each with their own duties and responsibilities. They are notorious for their violence in most of South Africa’s prisons. Motlagomang Oliphant, the national coordinator of Fear Free Life, says its relationship with the correctional services department is “very close” and strong. Its accreditation allows the group to run rehabilitation programmes in prison. Inmates sign a consent form pledging to leave their lives of gangsterism and drugs. Oliphant says their members and other organisations assist warders with their duties. “Our members are also prison marshals,” she says, adding that they assist warders with searching fellow inmates’ belongings for contraband and ensuring that inmates have toiletries and other necessities. Singabakho Nxumalo, director of communications for correctional services, confirms that Fear Free Life is “a quality assured, nonprofit organisation”. “They coach and support one another in promoting a peaceful environment which counters the start of gangsterism,” he says. It is this closeness with correctional services – not lost on the general prison population – that has led the gang members to believe they are powerless against Fear Free Life, inmates told the WJP. "They are doing mob justice"
Within Johannesburg Prison, Fear Free Life’s headquarters is stationed in A-Section of Medium B. This is where troublesome inmates from other sections are placed to be monitored, according to the inmates interviewed by WJP. Soon after the inmates spoke to the justice project, on August 12 six members of the 26s gang were allegedly assaulted by members of Fear Free Life, who gained access to A-Section. The Fear Free Life members allegedly assaulted Coutts, as well as two of his fellow gang members. They then proceeded to E-Section, where they gathered three more gang members: Vusi Nkonyana, a high ranking member of the 26s, Tumelo Ledwaba and Allister Clarsen. A warder by the name of Masilela, stationed in A-Section, was the only warder on duty at the time of the assault, claims Coutts. During the assault, he recalls, Masilela was absent from the scene. Afterwards, he “arrived in the corner and said: ‘It’s enough now, I gave you enough time’,” claims Coutts. It was only then that the attack stopped. Coutts sustained lacerations to his head, black eyes, a broken arm and bruising on his neck and body. The other inmates who were assaulted sustained similar injuries and spent six days in the hospital. The WJP is also in possession of photographs of these injuries. Coutts says he now suffers from severe headaches and that his doctor explained that the people who assaulted him wanted to cause permanent damage. The Judicial Inspectorate for Correctional Services confirmed that the assaults took place and those involved were taken to the hospital before returning to prison to make statements. It found that some complaints dealt with inmate-on-inmate violence, while others were about warders assaulting inmates, as alleged in the second assault on the 26s gang. Those involved were then taken to single cells and placed in solitary confinement. Nkonyana alleges that for four consecutive days after the attack, Bongani Mabena, the president of Fear Free Life at Johannesburg Prison, gained access to their single cells and provoked and harassed them. “We couldn’t put up with this any longer,” says Nkonyana. On August 16, Coutts and the five other gang members retaliated during their concessionary exercise hour of solitary confinement. They allegedly attacked Mabena, stabbing him multiple times. Angelo* (not his real name), an inmate at Johannesburg Prison who claims not to be gang-affiliated, witnessed both assaults – including the stabbing of Mabena. “Warders let Fear Free Life assault inmates, and [warders] clean up after,” he says. According to Angelo, Mabena was allegedly stabbed three times in the neck, four times in the arm, as well as in his ribs, back and foot. The stabbing caused an eruption of violence. “We were beaten so severely that, all of us, our hands are broken [and] I have stitches in my head,” says Nkonyana, adding that the inmates were beaten with batons and “they were using the fire extinguisher; they were even using an iron rod”. That same day, those who were involved in the assault were taken to Chris Hani Baragwanath Hospital, where they were medically assessed. WJP went to the hospital and a member of staff confirmed that Mabena was admitted into intensive care. However, Oliphant admits that some members have joined Fear Free Life “to gain favour with the correctional services department”, claiming that the organisation can only count on its disciplinary processes to weed out wrongdoers. This includes formal hearings between Fear Free Life’s senior leadership and members. The WJP contacted Fear Free Life founder Khumalo. In response to the allegations against his members, he said: “Fear Free Life is not a vigilante group. Our aim is to do conflict management. Those who participate are law-abiding citizens and inmates. When asked about the assaults in Johannesburg Prison, Oliphant lambasted the WJP for speaking to inmates in her absence, despite not having authority over them, saying: “You will have problems with us” [for continuing with this investigation]. Despite this, the head of Johannesburg Prison Medium B, Samuel Mahlangu, told WJP that gangsterism at his centre had declined from 17 cases in 2013 to just one in 2016. This year, however, it might be on the rise. Coutts has subsequently been transferred to Kutama Sinthumule Correctional Centre in Limpopo, while two other 26s involved were transferred to Mangaung prison in Bloemfontein. According to Nkonyana, this is an attempt to calm the prison down. Charges have been pressed against the gang members and Fear Free Life. Nkonyana and other 26s involved in the stabbing of Mabena are still in solitary confinement in Johannesburg Prison.